Yesterday wrapped up the 3rd avalanche course of the season and the first course with recently AIARE 1 instructor certified EMS Schools Guide Mike Lackman co-teaching. Mike had joined me for the Instructor Training Course in Stevens Pass a few weeks ago and it was great to have a co-instructor to work with over the last three days! 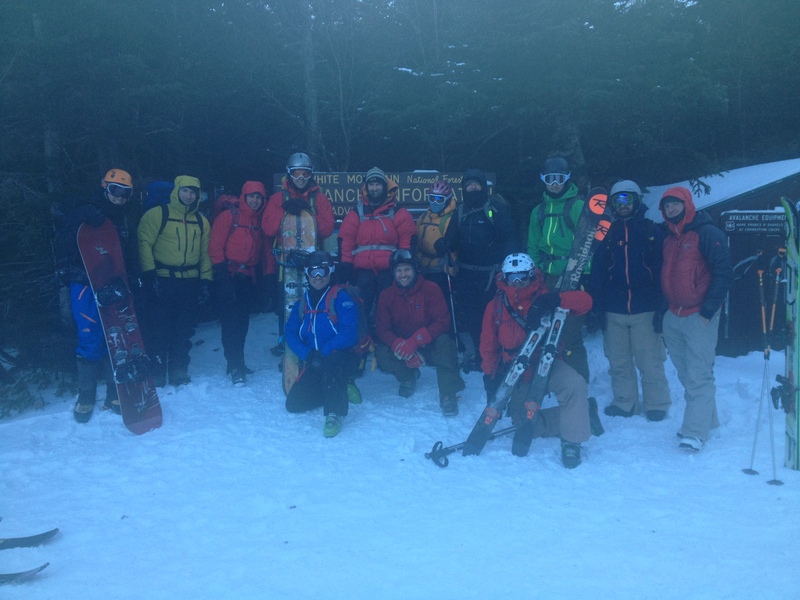 Twelve participants from Canada, Maine, New York, Massachusetts and Ohio joined us at the AMC Highland Center for two days of classroom and field sessions to learn about decision making in avalanche terrain before heading up into Tuckerman Ravine to put it all together on Day 3. After we wrapped up our field session on Day 1 some of us headed to Frontside Grind in North Conway where the recently formed Friends of Mt. 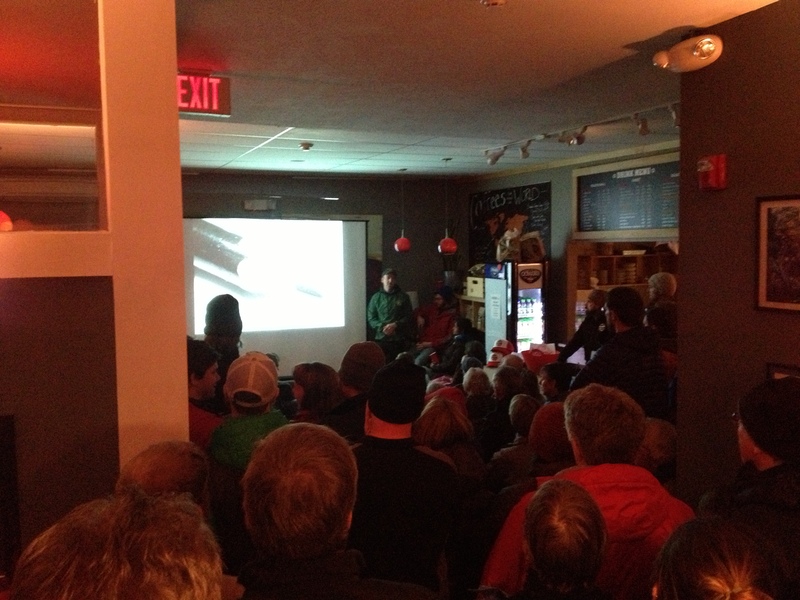 Washington Avalanche Center was hosting a fun slideshow/fundraiser. Free beer, Tuckerman Pale Ale of course, delicious pizza provided by The Flatbread Company, great silent auction, and a really informative slideshow showing some of the history of the Avalanche Center entertained a standing room only venue. 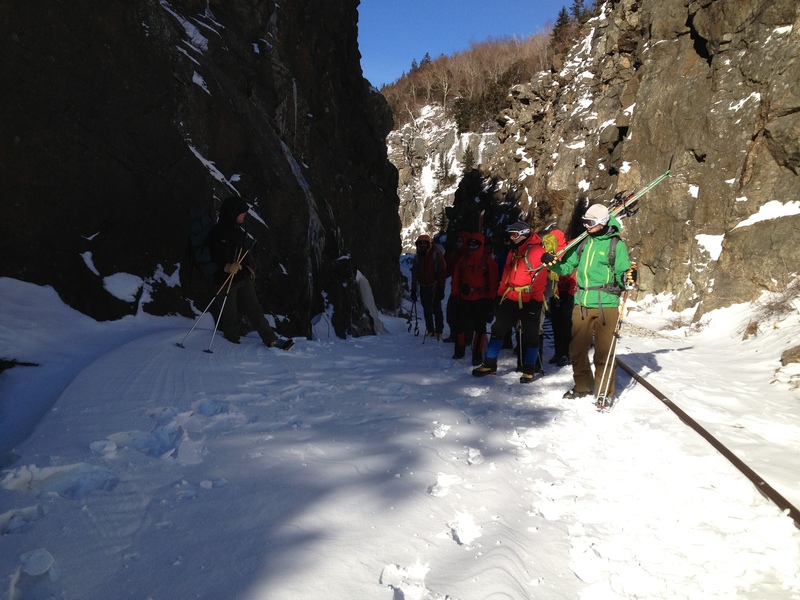 The next day after some morning classroom we headed through Crawford Notch to look at some avalanche paths and make some snow & weather observations. During our Observational Outing we found significant wind slab, wind crusts, and some great Surface Hoar in a sheltered area not far from the above photo. Later in the day we got some interesting Compression Test results in our shallow faceted snowpack. Despite being behind in snow totals for the month of January we still have a very interesting snowpack to learn from! Day 3 we gathered at Pinkham Notch Visitor Center and after working in small groups to come up with a trip plan for the day we headed up in to Tuckerman Ravine. Mother Nature was temps struggled to reach double digits and wind chills made goggles and face masks quite necessary above Hermit Lake. Visibility however was excellent and we viewed quite a bit of terrain, along with a very fresh crown line at the top of the bowl. Digging around in the snow below Right Gully provided another chance to look at layering in the snowpack, and by 2:30pm we were starting our descent back to PNVC and a productive course wrap-up. With last weeks 12 person avalanche in Central Gully lots of former students have asked my opinion. I think Jeff Lane’s well written accident summary pretty much echos my thoughts, so I’ve linked it here. Next weekend we are not running an avalanche course, but I have a 2 day private ice climbing course and a 3 day mountaineering program scheduled. The following weekend I will be heading to Lake Placid to teach an AIARE 1 Course in the Adirondacks. If you are interested in hearing how these pan out, personal product reviews, and about future avalanche courses in the White Mountains please subscribe to this blog’s email list by entering your email address in the top right of the blog.